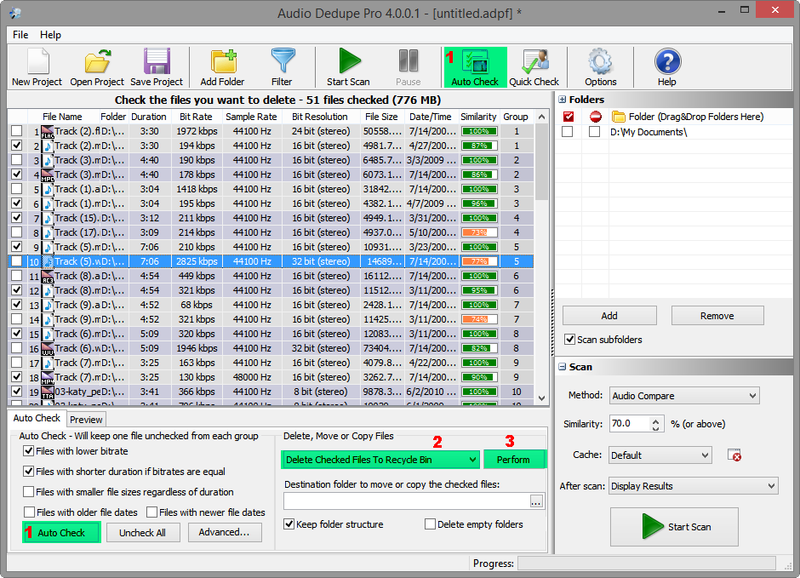 Audio Dedupe Duplicate MP3 Finder 1.2.0.1 is released. Audio Dedupe besides finding duplicate mp3 files now supports also - AAC, MP4, FLAC, AC3, WavPack (WV), Musepack (MPC) and Windows Media Audio (WMA) file formats. It also adds support for FLAC, WMA and MP4 tags. AIF is now recognized AIFF extension. You can now quickly rename files using F2 or Rename popup menu (only in registered version). Project modified status in program caption is now updated correctly. -db <dbfilename> - specifies the cache file name to be used or created. You don't need to create the cache file. Just specify it as a parameter and the program will create it. Or if the cache file from previous scan exists the program will use it. The cache files extension is ADCF (Audio Dedupe Cache File). Example: AudioDedupe.exe -src_list "c:\src.txt" -target_list "c:\target.txt" -log "c:\log.txt" -s 70 -db "c:\db.adcf"
Note: If some of the parameters contain spaces, you must enclose them in double quotes. Example: -src_list "c:\program files\files.txt"